Do you know a tennis coach in your community you think would be an ideal candidate to be MomsTeam's tennis expert? Send his or her name to info@momsteam.com. 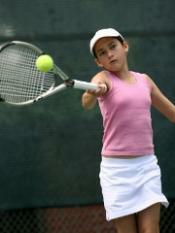 Tennis is a fun, fast-paced game that is easy to learn and requires a high level of fitness. Tennis is an Olympic sport and can be played at all levels and ages. Tennis is being introduced into more schools as part of physical education and after-school programs; there are also junior and collegiate teams. This game may be frustrating at first for children because it takes a lot of practice to become good at serving and hitting the ball, and anticipating where it is going to be hit next. Besides a great amount of speed and agility, Tennis requires a lot of thinking (i.e. : where is the ball going next so you can be ready for it in that position, out-smarting the opponent). However, once children learn the fundamentals, they love the game and become competitive. MomsTeam's goal is to provide comprehensive information on tennis: advice on the equipment needed and how to buy it, a primer on the rules of the sport, and videos and advice from experts, parents, and manufacturers of tennis gear. But to do that we are going to need your help. If you are a parent of a child who plays tennis or has played tennis, we hope you will share what you have learned with other MomsTeam parents. Please consider writing a blog, contributing an article, posting on and/or hosting a Forum, or becoming a tennis expert. If you know of someone who used to play or coach tennis who has knowledge to share, ask him or her to join. Together we can make MomsTeam a true community of sports parents!